Royal Australian Navy Anzac Class frigate HMAS Ballarat has taken part in maritime warfare exercise Intrepid Sentinel alongside forces from France, the UK and the US. Ballarat joined France’s Marine Nationale F70AA Class air defence destroyer FS Cassard, the UK’s Royal Navy Daring Class air defence destroyer HMS Dragon, aircraft carrier USS John C. Stennis, guided-missile cruiser USS Mobile Bay, and guided-missile destroyer USS Spruance in the exercise. The vessels were put through a series of integrated events, using air and surface platforms to build proficiency across "multiple warfare areas and promote integration of multinational maritime forces in the area of operations into a cohesive combat force". “The exercise itself is meant to develop interoperability, because one of our overall goals is to develop the opportunity to where we don't have to have a particular situation or a defined event that happens to bring us together,” said Captain Murzban Morris, commodore of Destroyer Squadron (DESRON) 21. “We should have that interoperability and operate together at a moment's notice. So that's what this exercise is about. So that whenever we may need it we can come together whether or not there is a crisis." Ballarat also conducted deck landing qualifications (DLQs) with Sea Hawks from Helicopter Maritime Strike Squadron 71. “Training to work together on a different platform, to work in close proximity together, and to land on a new platform gives us the ability to expand our skillset,” said Lieutenant John White, a pilot assigned to HSM-71, the helicopter aircraft commander of one of the cross deck flights. 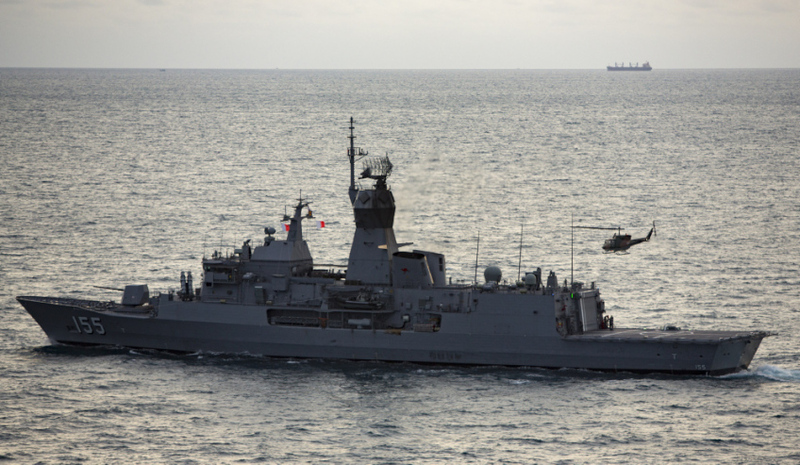 Lieutenant (Junior Grade) Beau Denson, the tactical action officer for John C. Stennis, was also impressed by the professionalism of the Anzac Class frigate. “We conducted an integrated live-fire exercise led by the HMAS Ballarat,” said LTJG Denson.